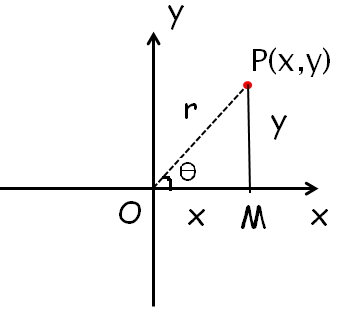 About "Argument of a complex number in different quadrants"
Let (r, θ) be the polar co-ordinates of the point. denoted by amp z or arg z and is measured as the angle which the line OP makes with the positive x-axis (in the anti clockwise sense). How to find argument of complex number ? here x and y are real and imaginary part of the complex number respectively. This formula is applicable only if x and y are positive. But the following method is used to find the argument of any complex number. Let us see some example problems to understand how to find the modulus and argument of a complex number. Since sin θ is positive and cos θ is negative the required and θ lies in the second quadrant. 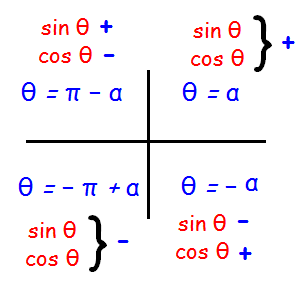 Since sin θ and cos θ are positive, the required and θ lies in the first quadrant. Here α is nothing but the angles of sin and cos for which we get the values 1/2 and √3/2 respectively. Since sin θ and cos θ are negative the required and θ lies in the third quadrant. Here α is nothing but the angles of sin and cos for which we get the values √3/2 and 1/2 respectively. After having gone through the stuff given above, we hope that the students would have understood "Argument of a complex number in different quadrants".